Sewer problems often leave "Tell-Tale" signs that you can easily identify during a routine walk-through inspection of a property. Listed below are some of the most common "Tell-Tale" signs. If you encounter any of them, it would be wise to call Hydro Physics® for a closer look. If there is a real problem, the information we provide will enable you to assist your client in making an informed decision on the property and/or the most cost effective way of solving it. 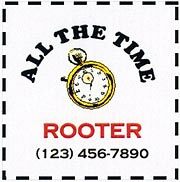 Sewer lines usually have a "clean out" access normally situated vertically on the main sewer line in the basement, crawl-space, or occasionally outside. In residential construction (prior to the 1980's) a brass "plug" was used. If the original plug has been replaced with one of those pictured here, some sewer work (usually cleaning) has been needed in the past. The presence of these stickers on or near sewer pipes often indicates the sewer has given the owner problems at some point. In addition, they may also indicate that the property is on a "preventative maintenance" program for regular cleaning to prevent future back-ups. Water stains around the floor drain in the basement are an obvious sign the sewer line is not draining properly. 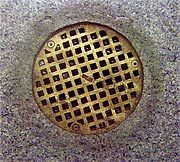 Because the floor drain is usually the lowest access point to the sewer, it provides some of the first symptoms of a sewer problem. 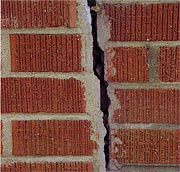 Walls or floors cracking indicate movement of the foundation. Shifting foundations can be caused from excessive water in the soil which may be coming from a broken underground sewer line. Other "Tell-Tale" signs of a broken sewer are: sink holes, foul odors, water stains on walls or floor, or concrete patches over drill holes from "mud jacking" operations.